MaSDiV (2017-2020) is a high-level research and evaluation project involving leading STEM education institutes from across Europe and 11 ministries of education. The MaSDiV partners will develop and implement a course for STEM teachers to better equip them to promote science and mathematics literacy for all students (including disadvantaged students from diverse cultural and social backgrounds) together with the learning of fundamental values in multicultural settings. Further, we will rigorously evaluate this course using a multi-method research design. In this policy experimentation measure (funded within Erasmus+ Key Action 3), the aim is to scale-up successful measures across Europe. In Malta, MaSDiV is led by the University of Malta (UM) working in collaboration with the Ministry of Education and Employment (MEDE). The University team is made up of Dr Josette Farrugia, Dr Michael Buhagiar & Dr James Calleja. The team from the Ministry is made up of Ms Mariella Galea – Education Officer (Mathematics Secondary) & Mr Stephen Bezzina – Education Officer (Diversity, Learning to Learn & Cooperative Learning). 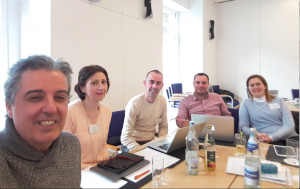 The aim of the MaSDiV project is to develop a research-based, quality-controlled and tested measure – a teacher professional development course to promote inclusive STEM education – that will be broadly implemented and scaled-up across Europe. We will develop a course according to latest research and standards regarding PD quality and base it on a well-researched STEM education concept – inquiry-based learning (IBL). In MaSDiV, we will further further develop and expand IBL in suitable ways to promote science and mathematics literacy among all students under the conditions of diverse and multicultural classrooms. A truly innovative feature of this course is that it links STEM education and IBL to the learning of fundamental values and intercultural learning. The PD course aims to develop teachers’ competence to practice inclusive science and mathematics education for the learning benefit of all students, regardless of their cultural or socio-economic backgrounds. The main target groups are lower secondary school teachers in general education across Europe. We will use a pre-post design to experimentally test the developed measure in six countries. Our multimethod evaluation design reverts to quantitative and qualitative proceedings. Evaluation will allow for a reliable assessment on the measure’s effects, as well as on routes to scaling-up the measure. Leading science education research institutes who are members of the International Consortium for STEM Education, together with European ministries of education are developing the measure. The project runs from2017 to 2020 with its final year devoted to initiating a scaling-up process for the measure so as to ensure that the PD course will be implemented to the widest possible extent in national educational settings. MaSDiV’s cooperation with 11 European ministries of education and its connections to relevant national and European networks and communities in STEM education from research, policy and practice ensures that the project will maximize its impact and thus, maximize its benefits for a high-quality, socially relevant, just and inclusive STEM education. incorporating intercultural learning in mathematics and science classrooms. Delivering inclusive STEM education linked to citizenship education and intercultural learning is, however, not a trivial task. Consequently teachers need support (EU-WG MST 2013, EU-WG PD 2013, Arjomand et al. 2013). Here, we find shortcomings in Europe. Experts have marked out a need to substantially improve the quality of STEM PD offers (Hazelkorn et al. 2015) and mismatches exist between teachers’ expressed need for training in suitable approaches and the course offerings available (Eurydice 2015). The project Consortium consists of 13 institutions. It is comprised of university-ministry tandems in six countries that will jointly develop and test the measure in 2017/2018. An ‘evaluation institution’ is in charge of a thorough evaluation of the measure. The project Coordinator is the International Centre for STEM Education at the University of Education Freiburg.